I have an 82 YT175 motor that came in a couple boxes. There is a 30mm spacer that was left on the head sided of the cylinder. The parts breakdown and gasket set only have a single gasket. The head doesn't look like it has been shaved. The only idea I can come up with is that the cylinder was shaved on the bottom to move the ports down and the spacer used on top to make up the difference. Any other ideas? The piston hasn't come yet. After I bore the cylinder and install the piston it might give me a better answer. I'm no expert on modifying two strokes, but 30mm sounds like an awful lot of material to shave off of the bottom of the cylinder. That's over an inch (1"=25.4mm). I have no idea what it may be for. You may be better off trying to find another cylinder if it was shaved that much. Pictures for the love of Pete! How could you post a tread like this sans pictures? Sheesh! My mistake. 3 shims .12mm each totaling .36mm. Each shim is is made up of 3 shims fastened together. They are metal. The oem head gasket measures .12mm. There are marks on the top of the cylinder that makes it look like it might have been turned down but they are very vague. Is it possible these are head gaskets that would be used to adjust compression. I have pictures on my desktop but haven't figured out how to add them. I see insert image but it won't work any way I tried. Not sure if you're a cellphone user or not, but on pc you just go to manage attachments, add image and upload it. Once it shows up in the bottom (can take a while if slower internet), then just close the window and submit your reply. Don't worry about the insert inline stuff, that's for formatting where the image shows up and such. If you're on mobile, I have no clue, I'm a PC user, I can't stand the tiny screens to browse the web, give me my dual 24in screens any day, planning to upgrade to 32in some day, have one but not the 2nd yet. Defo weird on the shims, checking where the piston tops out should show a bit of a story. Normally people want to increase compression, not reduce it, moving the cylinder ports down could be an option, but I think generally for higher rpm tuning you move the ports up. Can you see any signs of porting? Getting another cylinder might be a good idea so you know what you're starting with, unless you want to try to build off of whatever was done to it in the past. Good luck on the project. That worked. I download 4 pictures. Cylinder shows no signs of porting. The base of the cylinder doesn't look like it has been milled. Nice the photos show up, no clue what those cylinders look like stock so can't really say if it's been modded (I'm looking at the porting areas). Looks like it might have been squared up some but could just be stock too. Also the pc tech is going crazy inside me lol. When you send something to a server/site, it's uploading. When you receive something, it's a download. From the server's point of view, it's the exact opposite, you sending the pics to 3ww is an upload for you, but the website server sees it as a download. The site runs on a computer just like you use but built with higher end parts that are designed to run 24/7 for years. Anyway, not trying to bash you for using the wrong term or anything, just trying to inform you. Just a theory, but maybe a couple of those gaskets were used for base gasket spacing. Did it come to you assembled or apart? 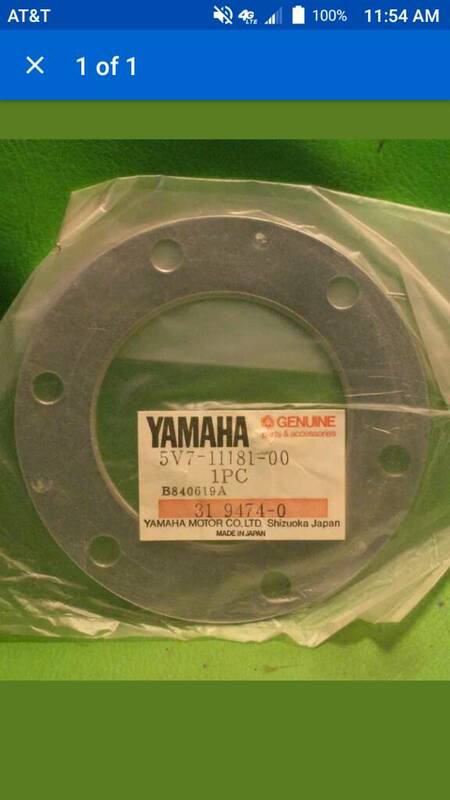 Also does the gaskets fit the base of the cylinder? The top surface of the cylinder looks quite clean and machined, but the head kind of looks similar too, maybe it's just the factory machining. I think dry fitting the piston/cylinder together is kind of a must to see if anything was shaved down. Do you have/know how to use a degree wheel? Probably null and void, but you could note down the timing specs for your ports before you assemble. I don't see any port specs in the service manual. Looks like the ATC250R is the same way, I guess only 4 strokes got the timing info. My 2-cents is it’s a stock head gasket and u have what looks like 3 used ones. 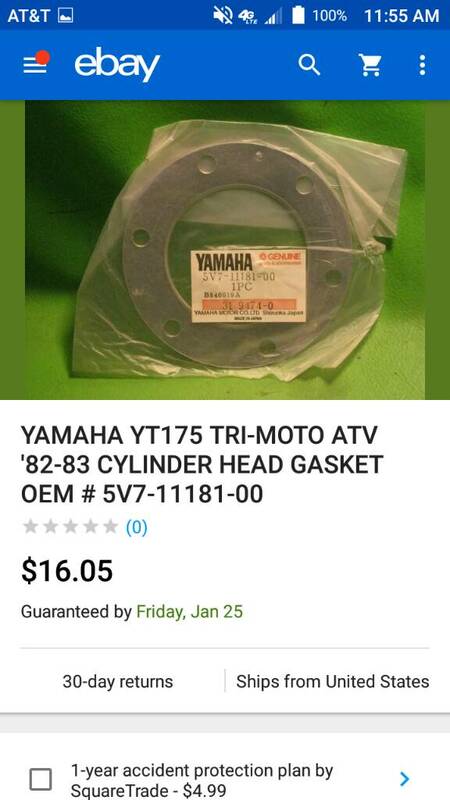 I have no idea on your yamaha but on the Honda 200x the head gasket is a metal 3-piece unit tacked together, kinda like you have or (describing). Your thinking “shims” but it’s just a head gasket, well 3 used ones that were in the box. The engine came well disassembled in a couple boxes. Cases split so a lot of sorting and finding parts that were missing. I hate when these kind of projects are brought to me. Take it out of the frame but don't disassemble the engine. He even got it this way from another guy so nobody knows any history. The shims/head gaskets were on the cylinder with all 6 nuts on. I know it would be hard to measure but would anyone know what the dimension between the base and head surface on the cylinder? Does anybody know if the stock head gaskets were metal or composition? Could these be just 3 stock head gaskets. Talking to the local longtime Yamaha dealer he thinks they were metal but he can't remember for sure. I've looked at several on Ebay. Hard to tell but the metal ring and the dark color makes it seem like they are composition. Of course the little dimples makes it look like a stacked metal gasket.